LOGIN to add your feedback. Error: Subscribe to Dental Update to view, or purchase this article. 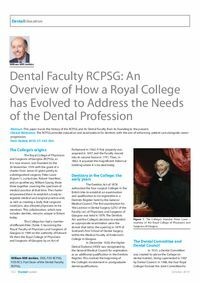 Abstract: This paper traces the history of the RCPSG and its Dental Faculty from its founding to the present. Author notes: William MM Jenkins, DDS, FDS RCPSG, FDS RCS, Past Dean of the Dental Faculty RCPSG. Objective: To describe the changes made by a Royal College in order to maintain its links with all members of the dental profession.